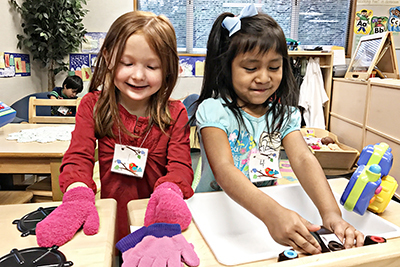 The El Dorado County Office of Education’s (EDCOE) Child Development Programs provide high-quality, early child care to students in El Dorado County generation after generation. 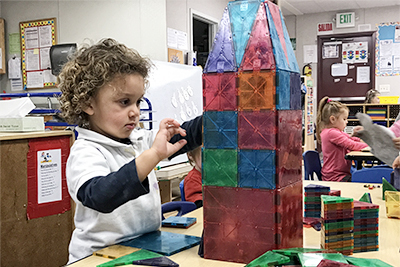 Head Start Teacher, Sandee Bangs, and Classroom Assistant II, Sandy Maggard, have worked in the program located at Schnell School for decades and have become part of their students’ families. “Past students return to our preschool program with their children, and one of the parents even honored us by naming her little girl Sandra” said Sandee. Entering their classroom is like walking into a concert of orchestrated excitement as two people conduct a half-dozen groups of children participating in various activities. Students, ages three to five years, strengthen their social and cognitive skills while pretending to be co-chefs in the play kitchen, trying on clothes for dress-up, reading books in a small library covered in family photos, making castles out of magnetic blocks, pretending to take photos with a play camera, and much more. Students are taught to be polite to one another, share, and clean up when finished with their activity. During circle time, an animated Sandee leads the group in exercises such as sing-a-longs, storytelling, and star-gazing at the ceiling which becomes the night sky filled with white lights from a projector. “We like to stimulate a higher level of thinking by asking the group open-ended questions and engaging them in everything we do,” Sandee noted. Each month is defined by a subject, and January was winter. At the beginning of the month, the library was filled with books concentrated on the season, and students were given a tub filled with fake snow to explore. Sandee explained that they integrate science into the classroom in different ways. “We have a sensory of the month. 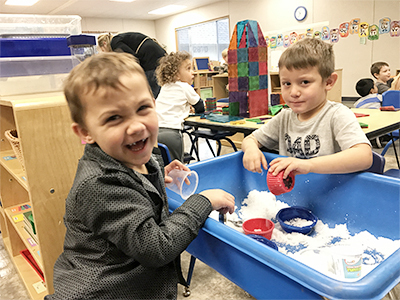 This fake snow is made of a plastic polymer and feels smooth to the touch,” she says as students scoop the snow into cups and giggle while watching it fall gently down. In table groups, students illustrate storms by creating construction paper clouds decorated in paper rain drops.